Lazing around a tropical beach with your new spouse might sound good to some newlyweds, but if you’d prefer a more adventurous entry into married life, visit one of these heart-racing destinations. If you and your fiancé are nature lovers, there are few places you can get as close to it as you can in Costa Rica. The Central American country’s incredible biodiversity comes to life on a canopy tour, so once the knot is tied, take to the skies and get lost in the verdant rainforests near Monteverde or Arenal. Tour prices can be as low as $50 and you can upgrade your experience with special add-ons like hanging bridge walks, aerial tram rides, tarzan swings, and even horseback rides. Outdoorsy brides and grooms will love starting their lives together at a rugged natural wonder like the Grand Canyon. In addition to world-class hiking and camping, this national park is also home to the Colorado River, which boasts whitewater rafting for all ages and experience levels. Whether you join an expedition for just a few days or a few weeks, it’s the best way to explore every hidden corner of this American gem. Perhaps you want your honeymoon to really spike your adrenaline. In that case, a shark cage dive off the coast of South Africa is just the ticket. There are plenty of tour operators in Cape Town ready to cart you and your sweetheart out to Shark Alley, where you can rub elbows with your favorite razor-toothed beasts from a galvanized steel cage. 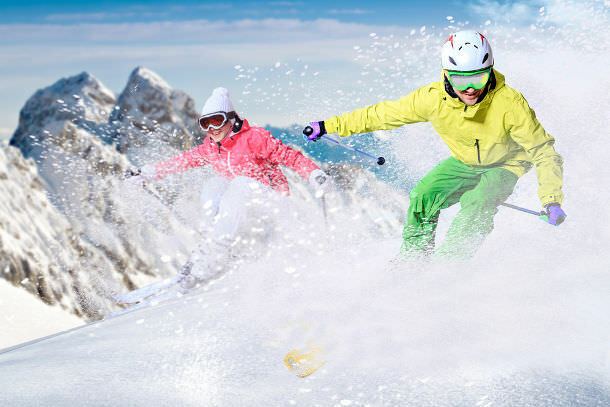 If you and your soulmate are serious powder hounds, a ski resort is probably calling your names for the honeymoon. Add an extra level of excitement with heli-skiing at one of Western Canada’s finest resorts. Splurge at Blue River or The Bighorn, or act out your favorite ski movies at Bella Coola Valley, all while cutting fresh trails into the purest, fluffiest snowfall either of you has ever seen. Maybe you’d prefer to heat things up in your first weeks of married life. The geothermal pools at Iceland’s Blue Lagoon are a nice, romantic place to start, but when you’re ready to go to extremes, Thrihnukagigur has just what you’re looking for. Tours don’t stop at the summit of this dormant volcano – you and your new spouse can venture 120 meters inside.